First off, happy New Year! 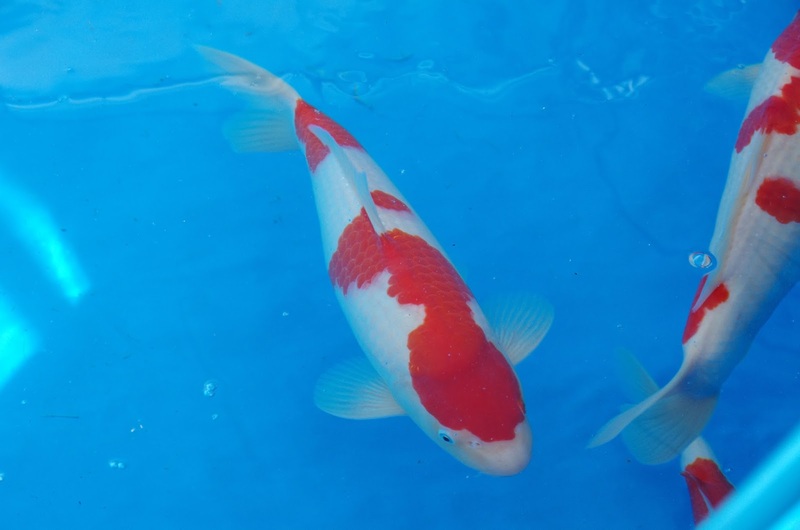 I hope 2016 treats you and your koi very well. I'm writing up this case study early on New Year's evening here in the UK, and I've picked one that has been an absolute joy to watch. It's one of the koi that's made the whole project worthwhile. 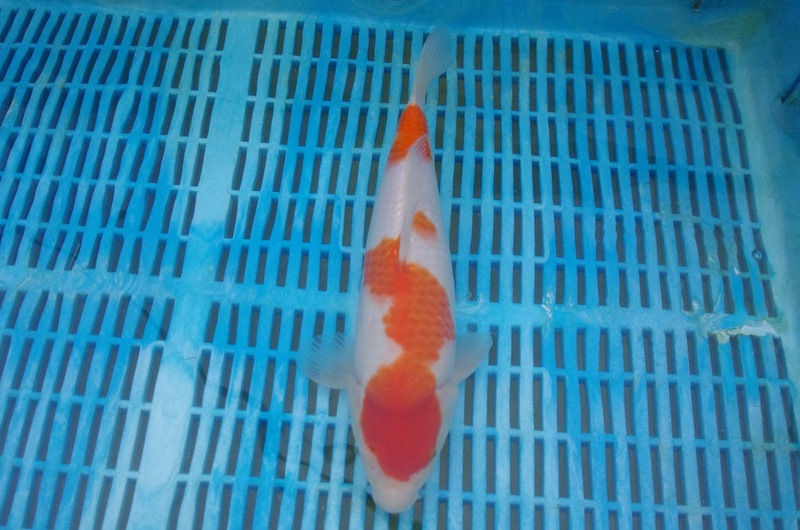 This koi stood out as the largest from the spawning, from second selection onwards. I remember thinking that, there's no way the largest one could also deliver me good red and white - and the fact that the pattern seemed to be pretty decent would be too good to be true. It went on to win some of my best show prizes of the year, at the South of England show in June - where it came 1st in size 3 kohaku out of 10 koi, and also came 3rd in size 3 overall! 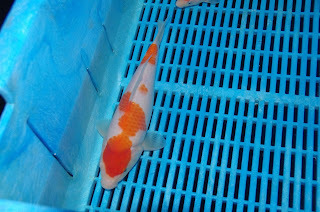 (ie, irrespective of variety), and that was out of 39 koi. And, at that point in time it was only 11 months old. 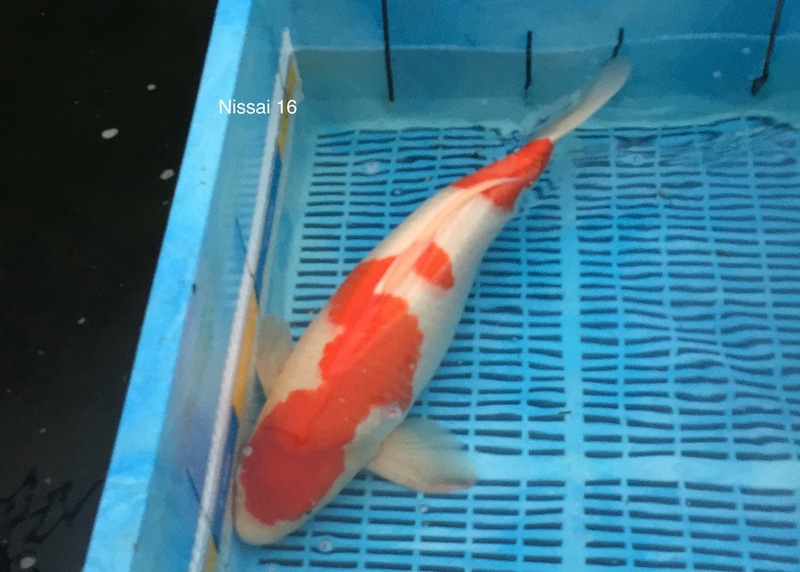 Achieving this level of result at an open show with a home bred kohaku was just fantastic - more than I could have hoped for, and it's continued to develop and grow well during the 2nd half of the year too. The only compromise is that, it is male. Which probably means it's body will develop in a less volumous manner than if it were female. 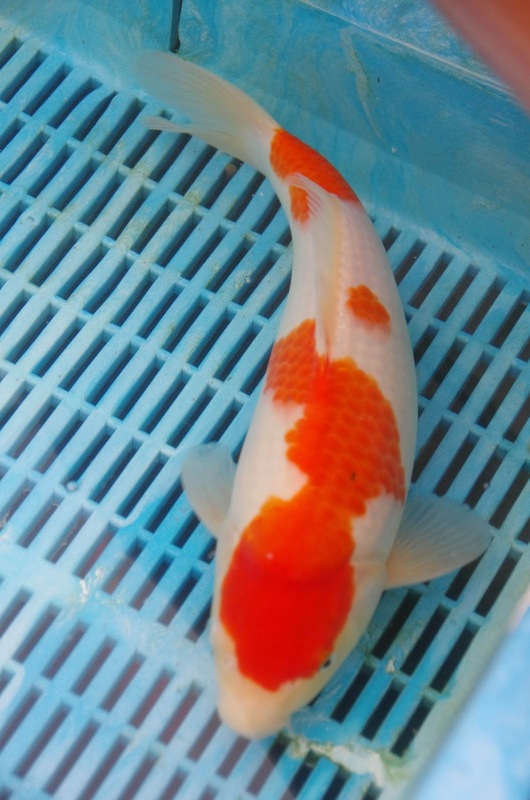 But, the results already achieved have been increadibly satisfying, and I'm enjoying seeing the development of the koi pan out. I've dug out the usual set of pics and vide; and watch how the pattern bridge between the head pattern and the shoulder pattern strenghens and widens over the year. This is a picture of it at the South of England show, and the koi was looking pretty good that weekend. Size wise, I remember it fell just into size 3, so around 36cm - certainly no larger than 37cm. The red had developed past the orangy tones it disaplayed over the winter, and this has continued to develop during the second half of the year. 27th September 2015 - at the All England show, where it didnt place. 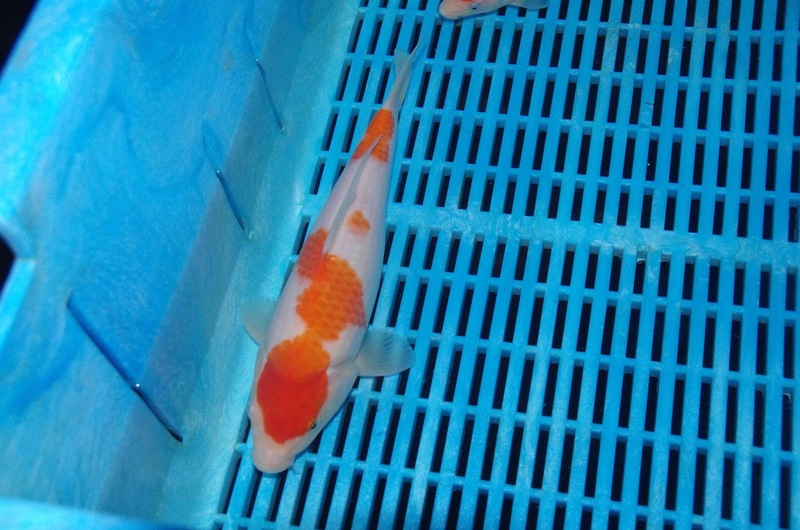 'Bubbles', the name of the koi at the bottom of the pic will be the subject of another case study. 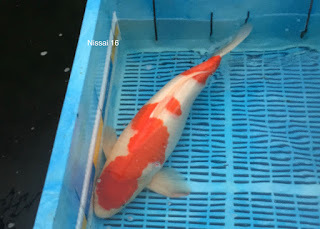 Measured on 22nd November '15 at 49.5cm; and also, finally I was able to find some roughness on the leading ray of the pecs which confirms what I already suspected, based on the body and pec shape, that this is indeed a male. A good grower, that's for sure. And the largest from the spawning, up to this point. 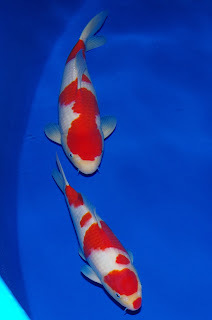 But general koi knowledge says that the females outgrow the males in time, and it will be interesting to see which females surpass this one over the next year or two. The pic from the 22nd November doesnt show the body well, and that's best observed via the video. 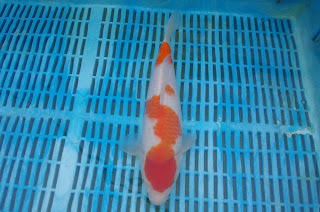 At the time of writing, this koi continues to do well and I look forward to the measure up in the spring.